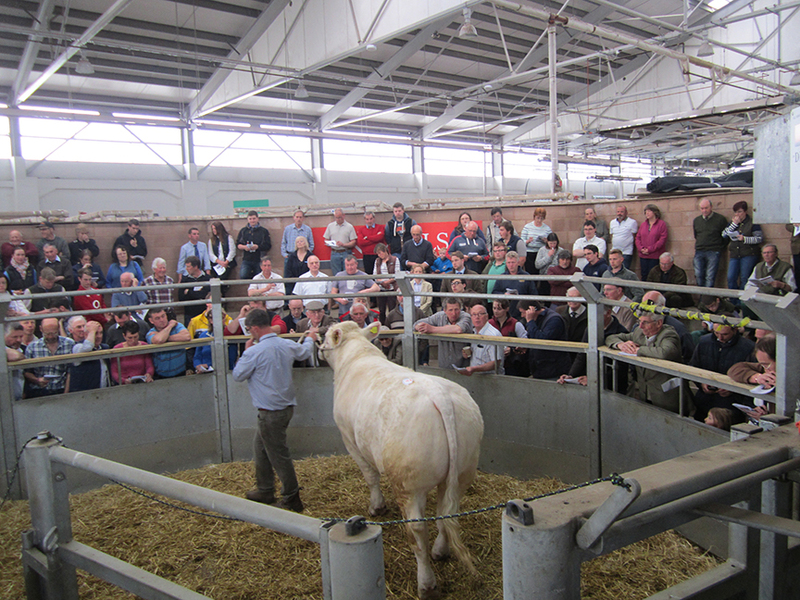 Females sold to a top price of 3,700gns and the 24 cow and calf lots averaged £2,254. Bulls reached 3,500gns with 8 lots averaging £2,783 at the 2006 established Martland herd dispersal sale on behalf of John and Caroline Wlyde, Woolavington, Somerset at Exeter Livestock Centre on Friday 6th May. Topping the prices at 3,700gns was a cow and calf outfit. The 2010-born Martland Flower sired by Moynton Carlton and her three month old heifer calf Martland Mayflower sired by Doonally Olmeto found a new home with DC Crosier, Middlezoy, Bridgewater. Just behind at 3,400gns was a split pair. The four year old Blelack Digger daughter Culmvale Honey TI +55 SRI +55 caught the eye of DP & B Smith, Dingestow, Monmouthshire who later purchased two more lots and her seven month old son Martland Lincoln sired by Blakestown Trustee was purchased by T Gaden, Stow on the Wold, Glocestershire. Another split lot going on to two separate homes this time for a total of 3,000gns was Champflower Cilla. This daughter of Tolland Universe bred by F Evens, Taunton, Somerset was snapped up by Jane Haw, Dorchester, Dorset and L Darch, Chard, Somerset purchased her July 2015-born heifer calf Martland Legacy sired by Skysea Fearless. The next pair went for 2,750gns and Jane Haw purchased the bull calf Martland Lancaster another by Skysea Fearless at 8 months old. His dam Martland Hippy a September 2014-born twin by the 14,000gns Devon County Show Champion Beanhill Echo caught the eye of MJ & GM Summers, Dulverton, Somerset, who also liked the look of her twin sister Martland Hoppy. Hoppy’s 9 month old bull calf Martland Lavish a son of Esperanto was purchased by CD Bailey, Iddesleigh, Devon and the pair fetched a total of 2,200gns. Next to purchase were JP and PC Turner, Tintagel, Cornwall who bought the four year old Martland Gabriella and her month old bull calf Martland Magnum sired by Skysea Fearless for 2,450gns. Gabriella who is a full sister to the 11,000gns Martland Heavyweight is a daughter of the homebred Martland Eric. Minutes earlier the 2010-born Moynton Tyrone daughter Martland Fifi and her two month old bull calf Martland Marmite – another by Fearless – were knocked down sold for 2,400gns to GR Gould, Minehead, Somerset. Finishing off the females at 2,300gns was another split pair. Littlebovey Cala bred by Mr H and Mrs E Vooght Bovey Tracey, Devon sired by Balthayock Tomahawk went home with JM Stone, Kingsbridge, Devon. Her eight month old Skysea Fearless son Martland Lionheart TI +47 SRI +50 was purchased by RS Robson, Launceston, Cornwall. The eight young bulls on offer met with a ready trade and leading the bids at 3,500gns was the 14 month old Martland Leon TI +41 SRI +40 sired by Skysea Fearless who goes on to work in Purton, Wiltshire with FR Crew. Making 3,100gns was the September 2014-born Martland James, the man behind the money on this Liscally Eti ET son was K Tovey, Bishops Sutton, Bristol. The fourteen month old Skysea Fearless son Martland Lourie TI +48 SRI +45 was the next highest priced at 2,900gns and was purchased by JS and J Down Ltd, Taunton, Somerset. 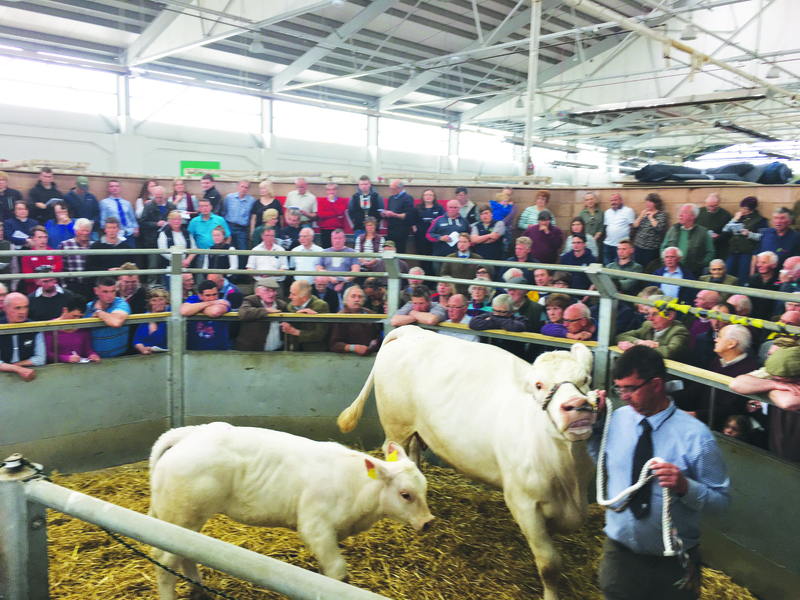 Two bulls were knocked down at 2,500gns a piece with the first being purchased by KM Clark, Newton Abbot, Devon. The January 2015-born Martland Levi is sired by Doonally Olmeto. Matching the 2,500gns price tag was Martland Larkin – another fourteen month old by Fearless. 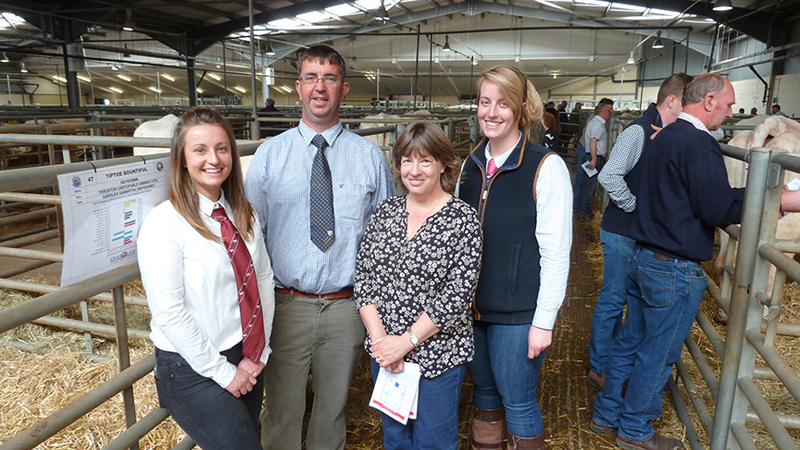 The final bidder was JP Williams, Yelverton, Devon.